The Firemen's Plot was first purchased in Mt. Hope Cemetery for the purpose of burying fallen firefighters in 1843. In 1880, the Rochester Firefighters Benevolent Association, realizing more space was needed, traded that plot for a larger section. The burials from the original plot were transferred to this new section. A 50 foot obelisk was also constructed for the new plot. 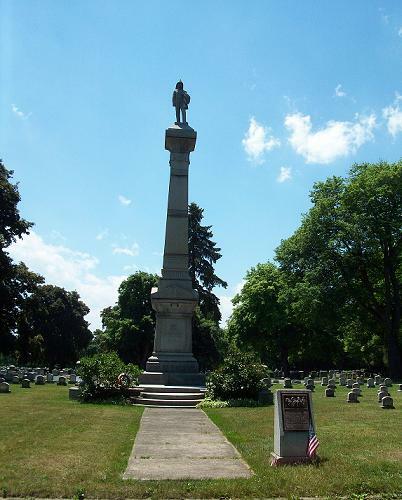 On Sept. 9, 1880 a ceremony was held to dedicate the new Firemen's Plot. The monument was re-dedicated on September 9, 1984. A similar plot also exists in Holy Sepulchre Cemetery. A plaque honors the horses of yesteryear, who were once a critical part of the fire service. The 1880 dedication and 1984 re-dedication is found at the bottom of the Firemen's Monument. Thomas Rathbun (d. 1827) was the first City fireman to be killed in the line of duty. He was killed by a collapsing chimney.